Remembering Loos :: Great War Dundee - This is the story of the 30,490 men that left Dundee to fight in the First World War and of the people left at home. 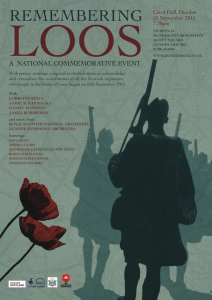 Remembering Loos: A National Commemorative Event with poetry, readings, song and orchestral music to acknowledge and remember the contribution of all the Scottish regiments who fought in the Battle of Loos (25th September 1915). The event sees a number of unique musical collaborations between the orchestra (Royal Scottish National Orchestra playing side-by-side with the Dundee Symphony Orchestra) and the various singers in attendance such as Dundee’s Sheena Wellington and the… Wighton Singers, vocalist Robyn Stapleton (2014 Winner of BBC Radio Scotland Young Traditional Musician of the Year), Scottish tenor and BBC Radio Scotland classical music presenter Jamie MacDougall and rising stars on the traditional scene – Dallahan. Other musical contributions come from young soprano Jessica Leary and the Mackenzie Caledonian Pipe Band, as well as the amassed orchestra performing pieces in their own right. Much of the musical content of the event has been rarely performed and there is the first performance of a new setting of the Joseph Lee poem The Listening Post – which has been put to music by Dallahan especially for this event. Presenters will be television presenter Lorraine Kelly, Jamie MacDougall, Daniel Portman (Podrick Payne in Game of Thrones) and Scottish author James Robertson. They will conjure up, with the use of poetry, newspaper articles and letters, a flavour of the times and deliver, using the words of those who were there, the stories of and behind the battle. Attendees are also invited to the Marryat Hall at 6.45pm for the launch of the Education Scotland Exhibition where they will have opportunity to see work produced by Morgan Academy and St John’s RC High School who have been working on a P7 to S1 transition project. The pupils have been learning about WW1 and the impact that it had on Dundee. Pupils started their work on this project last term and have adopted a model where they create their own exhibition panels and then act as guides/facilitators to introduce the subject to the local community. Alongside this exhibition will be the Loos Visualisation project produced by the University of Abertay. 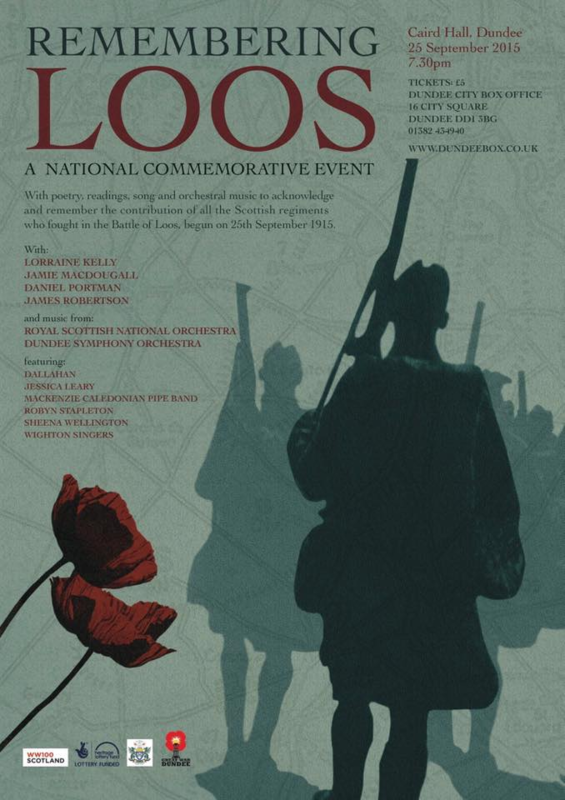 There will be a further opportunity to view both exhibitions at the close of the Remembering Loos event. Performance lasts approximately 1 hour and 15 minutes.